Former Wales defence coach Rowland Phillips has been appointed head coach of Italian side Viadana. The 46-year-old had been head coach of Pro12 side Aironi until their licence was revoked by the Italian Rugby Federation. Phillips revealed he turned down coaching offers in Britain in order to return to Italy. "I'm happy after a long hard think about things I've decided to go back to Italy," said Phillips. "I'm looking forward to what will be a great challenge." The former Wales back-row forward, who won 10 caps, played for Neath before moving to rugby league. He played for Warrington and Workington Town and represented Great Britain and Wales. 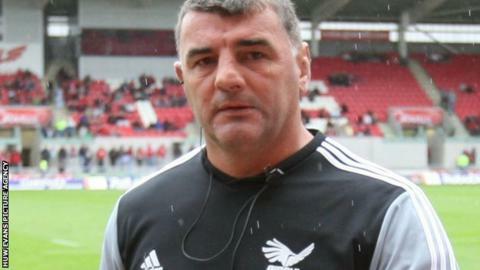 Phillips coached Neath before and after a brief spell with Wales under Gareth Jenkins and also coached at Ebbw Vale before moving to Italy in 2010.